What could be more satisfying than a relaxing trip into the woods to spend the night? Well, running into some cutesy woodland critters who’ll shower you with cash, of course. 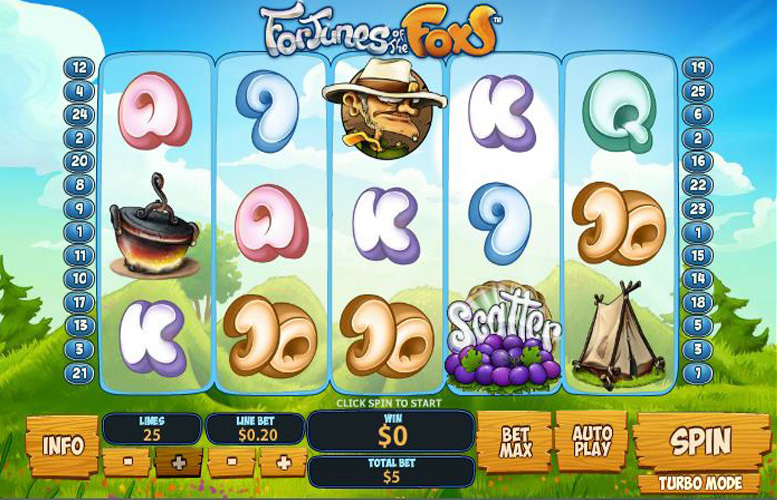 With the Foxy Fortunes slot from Playtech, you get all the peaceful tranquillity of a campout in the wilderness, and a chance to win big bucks whilst you’re doing it – all from the comfort of home. It’s a five-reel, three row slot. The bonuses on offer are somewhat standard but the visual experience more than makes up for the lack of features. So, join us for a trip down to the woods today, and cross your fingers for a big surprise. Up to 25 pay lines available. This substantially increases your chances of winning versus slots with less. Huge number of betting combinations. With options to set the number of coins bet per line, the value of each one, and the number of lines, there’s hundreds of different wagering variations possible. You can bet £50 across a single line, or 1p across all of them, and every possible denomination in-between. The imagery of the machine is relaxing, and soothing. The gentle woodland characters make for tranquil company. Coupled with the chilled soundtrack, this machine sure aims to please those who prefer their action a little slower paced. The bonus rounds are somewhat standard. They’re not bad but they lack some of the creativity of other modern games. Some people won’t like the cute animal graphics, and lush woodland scenery. Those who prefer their slots to be all heroes and villains may be disappointed with the lack of action. The symbols for the Foxy Fortunes are all inspired by our title character’s home – the woodland. There’s, of course, Foxy Fox, as well as a camper, his canine companion, and a cooking pot, and tent. The highest value of these symbols is the camper. This will reward players with 5,000 coins if they’re lucky enough to hit five-of-a-kind. The other top prizes are 1,000, and 500 coins. These are won from five hounds, and either the pot, or tent, respectively. With the top coin value being a sizeable £5, the highest possible win excluding bonus round is £25,000. If you’re lucky enough to spin this in when free spins are active, your x3 multiplier will take the total win up to an enormous £75,000. Not too shabby for a night in the woods, eh? As we’ve mentioned, the bonuses on Foxy Fortunes aren’t the most exciting. There’s nothing wrong with them per se, but when we’re used to some of the other diverse and varied extra stages of some of Playtech’s other offerings, Foxy Fortunes feels a little basic. The “scatter” symbol is represented by a bunch of juicy grapes. 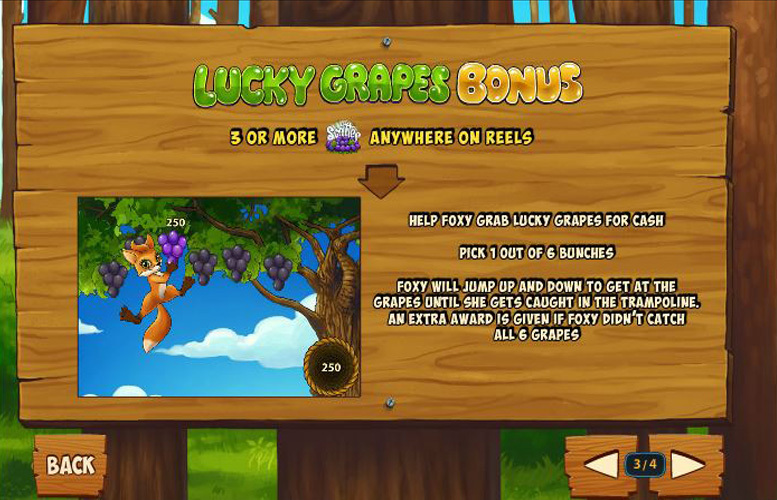 Hitting three or more anywhere on the reels will activate the “Lucky Grapes” bonus feature. Here players help Foxy Fox to spring up into the trees using a trampoline, and pick from six bunches of grapes. Each has a prize under, and the round continues under our star gets trapped up in the trampoline. Land the Foxy Fox symbol on reels two, three, and four and players will be awarded with 15 free games with a x3 multiplier. 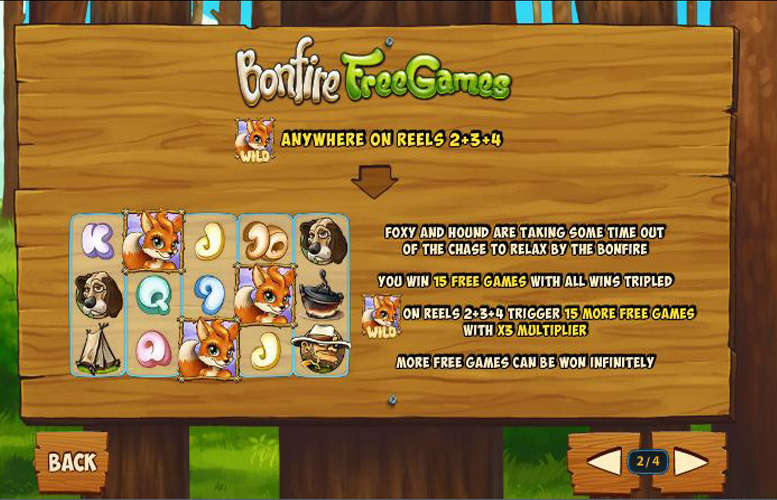 The game tells us that the fox and the hound are relaxing by the fire, and during this time, additional free spins can be won. In addition to the more highly paid symbols, there are also some that award less substantial prizes. These are the classic “face” cards from a standard deck of playing cards, with nine and ten added too (A, K, Q, J, 10, 9). 150x the coin value for either Ace, or King. 100x times the coin value for Queen, or Jack. 75x times the coin value for 9, or 10. As mentioned, there’s loads of ways to vary your bet in Foxy Fortune. 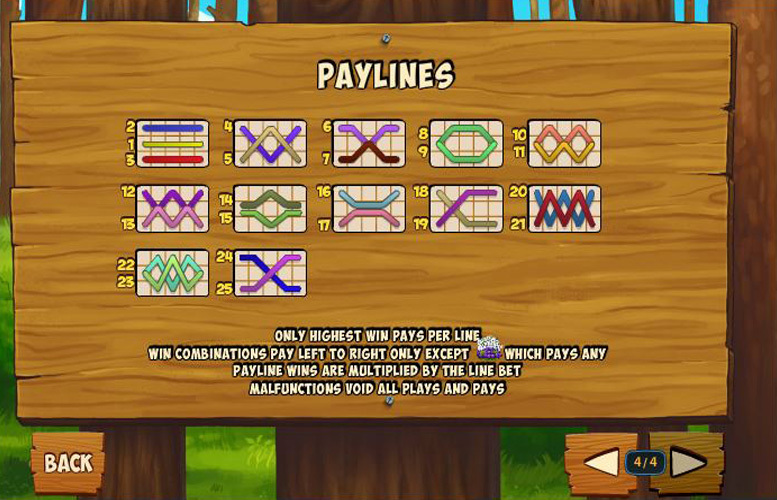 There’s up to 25 different pay lines active at once, and you can choose between one and ten coins to stake per line. Each coin can be adjusted in value too – the lowest being 1p, and highest £5. This means that the minimum possible spin is 1p (one win line, one coin per line, and 1p value), and the maximum is an impressive £1,250 (25 win lines, 10 coins per line, and £5 value). Whilst the looks of Foxy Fortune will not be to everyone’s taste, and it lacks some variation on its bonus stages, the overall impression of this offering from Playtech is a favourable one. The special features could be improved but they provide enough variety to keep those new to online slots happy, and if you love the great outdoors you’ll likely find the theme pleasing too. This game has a rating of 4 / 5 with 549 total reviews by the users.